optoblog.com » Blog Archive » Lemon Juice Drops? I’ve got tons of these, and I’m going to continue posting them no matter what you say. Or…what you don’t say, I guess, since no one seems to comment whether or not they think the new Optoblog cartoons are funny. Sure, the art isn’t there yet, but you gotta admit the lines are semi-funny, right? Firefox on Mac, if it matters. I’m not seeing it. I’m using Firefox and EI7 on a PC. Maybe your Mac is broken? I’ve been using the Google Hilite plugin for a long time. Maybe I’ll go see if it has any updates. Okay, I upgraded the Search Hilite plugin from 1.2 to 1.9. I guess I got a little behind on plugin upgrading since I’m so busy with WordPress upgrades which have been coming fast and furious lately. No no, they are funny! Keep them coming. Everyone loves a bit of satire. I like most of the comics. 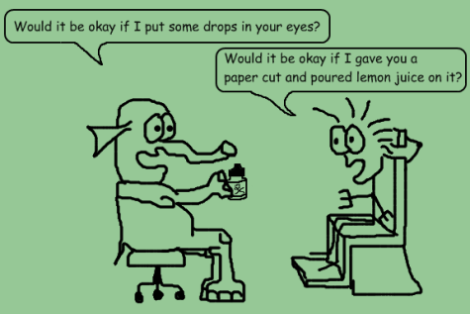 This one about the lemon juice is VERY funny.